Taking your newborn away from home for the first time is loaded with new worries. Will you remember everything? Can you avoid all the germs and dangers? It's not really that bad, and this list of the essentials for getting your newborn out of the house will help. Of course, it is best to stay home as much as possible with a newborn - but there will be doctor visits, maybe a visit to a relative’s house (but really, have them come over to you), or perhaps an unexpected errand. By newborn - I really mean a newborn - up to 1 month old. And by essentials - I mean the absolute basics. You may want to look at the 10 Best ‘Nice to Have’ Items for Newborns, as well as the 10 More Nice to Have Items for Newborns to see what else is out there. And of course, there is much more a newborn needs beyond a good night sleep and a refreshing bath. Check out the Top 10 Feeding and Diaper Needs, Top 10 Sleeping and Bathing Necessities, and the Top 10 Soothing and Illness Necessities for newborns. Car seat. Picking a car seat is not a simple task - there are many varieties and costs. I’ve put together a list of 10 Tips for Selecting a car seat to help, but most importantly, make sure it is new. Car seats have limited lifespans, safety generally improves with newer models, and any seat that has been involved in an accident should be discarded. Stroller. There are many stroller options - I’d recommend one that allows your car seat to snap in. You’ll probably end up getting more than one stroller - like a lightweight umbrella stroller when your baby is older. But for now, get a bulky one where they can lay back with proper head support. You can even consider getting a stroller that has a snap-in infant car seat, such as the Graco Click Connect shown here. This was the staple of our household. Diaper bag. Stock it well (see our diaper bag must-haves). Diaper bags are as much fashion accessory as functional bag for many moms. Given that fashion is subjective, my advice would be to get one with lots of pockets so you can organize your items. Look for one that has at least one zippered insulated pocket and comes with a portable changing pad. A diaper bag set like this also comes with a purse, making for a convenient option for moms. Baby Carrier. It's important to keep your baby close, warm, and secure, and baby carriers are great at this! Be careful of baby wraps, however. While they work just fine in theory, there are numerous reports of user error leading to baby injuries. The Baby Bjorn is still the best known carrier, and you can't go wrong with it. It allows for front carrying with the baby facing in or out. Travel blanket. I know I say it all the time - be careful of SIDS - blankets can lead to suffocation. That said, you can safely use travel blankets in strollers, car seats (put the blanket over the buckles), and in a crib if care is taken and the baby is old enough. White noise generator. These days, this is an easy one - simply get the White Noise Free or White Noise Lite app for your phone (iPhone link, Android link). You can choose from a variety of calming sounds - my favorite is the “stream water flowing”. Floor play mat. Keep it thin (in case the baby falls asleep - you don’t want a SIDS risk!). Our kids loved one similar to this one - it kept them engaged and it was fun for us as well. I mentioned this in a previous Top 10 list as well, and include it again because a play mat is not just great for home, but also very portable and perfect for visiting family or to get some protection at a hotel room. Painter's Tape. It is never too early to teach your baby to paint! No, actually painter's tape is like the duct tape of baby-proofing. This might seem strange, but you can use painter's tape to baby proof unfamiliar rooms (hotel rooms, rooms at family house). Cover electrical outlets, tape pinching hazards like drawers, tape electrical cords out of the way, etc. Travel Crib. The ubiquitous Pack-n-Play is perhaps the best known, and you can get a basic Pack-n-play model for $50 or less. Or, you can spend an extra $30 or $40 and get a deluxe pack-n-play that has a changing station and 'napper' that lets you save your back by having the floor of the crib raised up. Linking Toys. 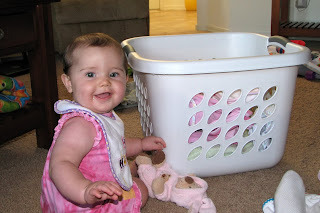 These are staples of newborn developmental play. They're safe, can be used for teething, are fun for kids, don't take much space, and can attach to strollers. Since this covers newborns up to 1 month, this means you don’t have to worry about solid food or your baby crawling and getting into things yet. However, you probably want to think about that now. See the Top 10 essential babyproofing safety items for a sneak-peak. You have a new baby on the way - what do you need? This is the list of the essentials for soothing your baby - whether it is medicine cabinet items, or things to just help them settle down. And of course, there is much more a newborn needs. Check out the Top 10 Feeding and Diaper Needs, Top 10 Sleeping and Bathing Necessities, and Top 10 Travel Needs for Newborns. Digital thermometer - rectal works best for newborns. Also have some petroleum jelly at the ready to apply to the thermometer before inserting. Nasal aspirator, sometimes also called a bulb syringe. When I was a new parent I thought this was totally unnecessary - but it only took a few weeks before we were needing to help our baby clear her nose. Nail clippers. Get one with a small magnifying glass - you’ll thank me later! Diaper rash cream. I know, I mentioned it in the diaper top 10 as well, but this is important stuff. Pacifiers. Some parents are very anti-pacifier, but my wife and I are neutral. We used them with one child, and our second wouldn't have anything to do with them. You may need to try a couple of brands to find ones that work for you - and they do come in different sizes. Mobile for the crib. Musical ones that automatically move work wonders! This mobile looks pretty nice - multiple music options, animals, and projects images. Lullaby music - can again work wonders. Your favorite music service, like Google Play, likely has plenty of options. Or you can buy CDs for just a couple dollars at your local baby store. Infant seat. One that wiggles or rocks and has music is great! The rocker below is a good example, or you can get a cheaper, simpler bouncer. Floor play mat. Keep it thin (in case the baby falls asleep - you don’t want a SIDS risk!). Our kids loved one similar to this one - it kept them engaged and it was fun for us as well. Where’s the infant tylenol, you might ask? Well, it is best to wait until at least two months old before using acetaminophen or tylenol. Since this covers newborns up to 1 month, this means you don’t have to worry about solid food or your baby crawling and getting into things yet. However, you probably want to think about that now. See the Top 10 essential babyproofing safety tips for a sneak-peak.